Coming up this Friday at 7:30pm in the Grand Hyatt, Muscat is the first MRFC party of the season. 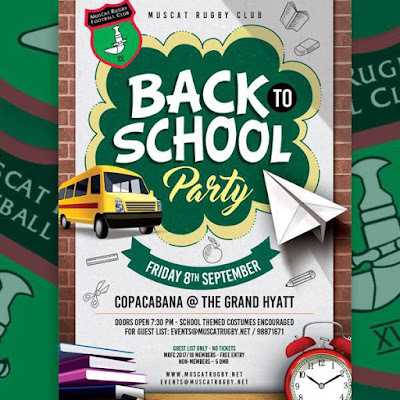 It's a back to school theme with prizes for the best dressed pupil and class clown. Tickets are free if you are a current MRFC member, or they are just RO 5 if you aren't yet a member of the club. How much of a discount on British Airways can a member of the MRFC get when booking flights? (you can find out all of the benefits, including the answer to the question by checking out the benefits page on the clubs website). You can see the FB event page here, the MRFC fb page is also here. I'll announce the winner tomorrow afternoon.